AFC Rushden & Diamonds are on the brink of reaching their main target for the season. Having been promoted to Step 3 for the first time in the club’s short history, boss Andy Peaks made no secret of his first aim for the campaign. 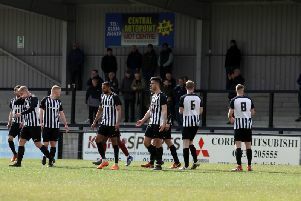 The Diamonds manager had targeted the 40-point mark, which he felt would be enough to secure the club’s status in the Evo-Stik League South Premier Division Central. Last weekend’s 1-1 draw with Lowestoft Town took Diamonds on to 39 and they will now be hoping go through the 40-point barrier when they head to bottom side Bedworth United tomorrow (Saturday). It just so happens that 39 points is currently enough to be in the thick of a fascinating battle for the play-off positions. But Peaks insists Diamonds must be “realistic” and with some huge games still to come this season, the manager is still focused on his main target. “Getting to 40 points is still my first aim,” he said. “We have got some big teams to come to Hayden Road in the second half of the season, that is a fact. “Points are going to be difficult to come by, we have to be realistic about it. “So, first and foremost, we have to make sure we get enough points on the board to ensure we are secure. “That was always the first aim for everyone at the club from top to bottom. “But I keep saying it, we are in a really good position and it’s a position people probably didn’t expect us to be in. “It’s interesting being part of it because it is so close in there and it keeps changing on a weekly basis. That next game sees them make the trip to take on a Bedworth side who have given themselves an outside chance of getting out of trouble at the bottom. They finally won their first game of the season with a 1-0 success over St Neots Town on December 29 and they grabbed their second of the campaign last weekend with another 1-0 victory, this time at Redditch United. It still looks a tough ask for the Greenbacks to haul themselves out of the bottom three as they are currently nine points adrift of safety. But Peaks knows it will be no easy task for his players this weekend. “I said when we played them at home that they were not going to keep on not winning,” the Diamonds boss added. “They have now won a couple of games and they have pushed teams extremely hard in recent matches. They have certainly turned the corner. “We are going there and it is a 3G pitch, which probably suits them more, so it is going to be a really tough game."